Taubmans Plans Service This is a good one-stop shop for plans. The website can be a bit hard to navigate. You should also be aware that this is a service. Many of these plans can be had for less cost elsewhere. So, you’re paying a bit extra here for the convenience of being able to look up the ship plans in one location. However, there are some plans that may not be available elsewhere including some of the old Boucher kit plans (now BlueJacket, but many subjects haven’t been rereleased) and the old, but excellent, Seagull plans by Hornsby and Crothers. Recently, I noticed some broken links on their plans list and discovered they are all related. Apparently, Taubmans is no longer carrying A.J. Fisher plans. These are still available directly from A.J. Fisher at the link below. The Smithsonian These aren’t model plans, but very accurate line drawings of the actual vessels, many re-executed from the U.S. National Archives plans or from the National Maritime Museum in England. Prices are reasonable and the selection is very large. However, the drawings primarily concern the shape of the hull and deck details and rigging detail is minimal to non-existent, requiring the ship modeler to reconstruct them him or her self. BlueJacket doesn’t list the plans on their site except for the 1/4″ scale models of the America and Jefferson Davis and the 1/8″ scale model of the USS Constitution. For others, you need to call them. While you’re at it, ask them to make sure that the particular plans you’re interested in are suitable for scratch building. But, given their excellent service, they’ll probably check on the suitability of the plans without your having to ask. Model Shipways plans can all be used for scratch building, but their later plans lack traditional plan views. You can rescale them, but you’re pretty much stuck building them the way the kits were designed. Their older plans, particularly those originally for their solid hull kits, are more suitable for POF or Solid Hull scratch building and are often very inexpensive when using one of their sale codes. Ages of Sail sells Amati plans which, like Model Shipways plans, are kit plans that can be used for scratch building. None of them contain traditional plan views, so you have to build your model the way the kit plans call for. You can resize them to whatever scale you want, but if you stick with the kit scale, you can sometimes find fitting sets for sale designed for the kit. This is certainly true of Amati’s Victory Models line. Also, Amati produces a couple sets of plans for models that they don’t produce kits of, but for which they sell decorative fittings sets. Also available are plans from Shipyard, a Polish manufacturer of paper kits. They publish 4 sets of plans, mostly frigates and mostly British. I have no idea how accurate the plans are, but they are beautifully executed and very detailed. If you see some of these listed as “Super Modelar Plans”, that means they include laser-cut card-stock parts for the internal structure for the purpose of scratch building the remainder of the model. A.J. Fisher still sells plans for the kits they used to make, but they are all designed for solid hull construction. These are mostly copies of old plans and the quality isn’t always that great. But, the subject matter is sometimes pretty rare and you might find them useful. Also, the newer plans, such as those of the Boston pilot boat Dancing Feather, are up-to-date and of very nice quality. 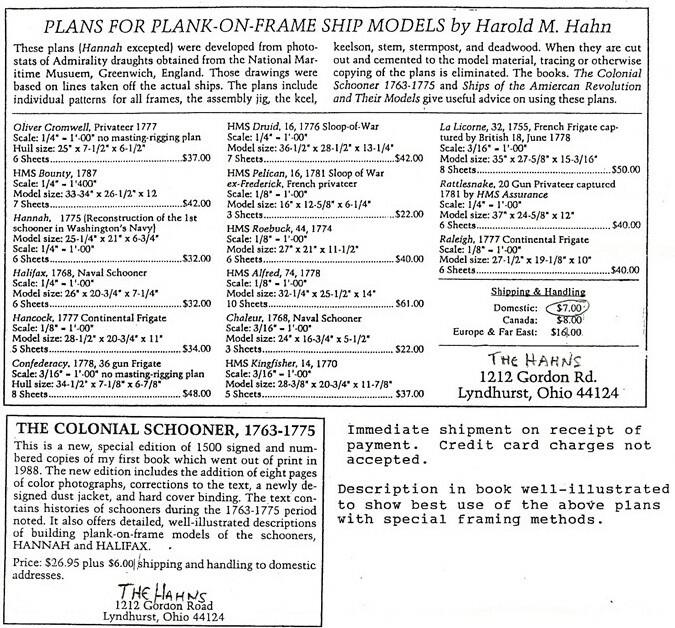 Harold Hahn plans are available from his son, but only by mail order. There is no website, so you’ll have to order by mail. Also, they only accept check or money order – no credit cards or Paypal. You can view a copy of the price list here. You might also be able to order the plans through The Lumberyard, which sells Hahn model timbering kits, and the plans may be available separately. Maryland Silver Company sadly appears to have disappeared and the link no longer works. They carried a large number of plans copied from the U.S. National Archives. This was about the only way to get these plans, short of a trip to College Park, Maryland, where the originals are located. Prices were reasonable and the selection was pretty good. They also carried a large number of plans of Civil War era monitors. Brown, Son and Ferguson, Ltd is the publisher of books by Basil Lubbock and by Harold Underhill. Also, all of Mr. Underhill’s plans, like the Brigantine Leon, the Brig Marie Sophie, the bark HMS Endeavor and others are available from them. Ancre Books While I listed this in the Publications section above, the plans published in their monographs are really incredible and worth looking into. The books that come with the plans may be available in english. But, even if not, the plans are all the same set. All are exquisite in detail. Library of Congress HAER or Historic American Engineering Record contain text, photos and plans drawn of existing structures to preserve their details. I’m not sure how many ships are recorded or whether there are plans for all major maintained historic vessels, but there is a lot of detail here. Looking for drawings of one of the ships you’ve seen at the Maritime National Historic Park in San Francisco? It’s probably here. Association des Amis Des Musées de la Marine This French association maintains monographs of plans drawn from models in the French National Maritime Museum. There is quite a selection here. While the main website is in French, some pages like the page I’ve linked to here are available in French or English. Likewise, some of the plans are available with text pamphlets written in English. Of 63 plans available, many plans are of 20th century merchant and warships. Plans are basic model plans with rigging and sail plan and plain paper copy of one or two photos of the museum model. 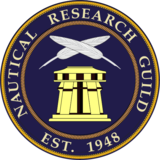 The Nautical Research Guild While known primarily for the quarterly publication The Nautical Research Journal and their Ship Modeler’s Shop Notes, the NRG has recently worked to promote the development of unique ship model plans. Plans now include the Continental Galley Washington, 1776, and the Generic East Coast Oyster Sharpie. More plans are presumably in the works, but this is a great start. Syren Ship Model Company Owner and ship modeler Chuck Passaro has been going to town with the expansion of offerings from his company. One of the latest is a set of model plans for the English Cutter Cheerful, 1806. The plans are for the construction of a plank-on-bulkhead model at 1/4″ scale. Eventually, we may see an offering of plans for the English Frigate HMS Winchelsea, 1764. But for now, the Cheerful is the only set of plans available. Museums. Of course, the ultimate source of ship plans are the many museums and museum associations around the world. Some of these have plans that cater to ship modelers, but most are drawings of the original vessels, which don’t always have all the information that a ship modeler may be looking for. Still, what information contained in the plans are usually the most accurate available. I say “usually” because in many cases, actual ship construction may have varied from the builder’s plans. That of course will require research on the modeler’s part. Wow, are you related? I don’t know of any source for H.E. Boucher plans, though I do see they appear from time to time on Ebay. Did you check with Taubmans? The only option that comes to mind is to check with Bluejacket Shipcrafters Inc., since that company is directly descended from his.